Where do you want to be in in one year? Where do you want to be in ten years? At least once in life it’s a valuable pursuit to take stock of life (and take stock of your health) and clear out anything that doesn’t empower you … to step into a new and bright cycle in life. Are you ready to completely assess your life and your health and then take steps for the future you desire? Are you ready to drop some physical weight as well as emotional weight from your life? We’re ready for a reset in our lives . . . and for the month of July we’re going to be working on our own intensive reset and would love to mentor a few people who would like to do the same. Denise’s very favorite thing in life is to help someone’s dreams come true. It juices her like nothing else. She feels that her journey in life is as a “dream maker.” We are so very excited to mentor a small group on a health, vitality, total life-reset program. We are so passionate about your dreams coming true. It’s been quite a year and we’re ready for a new shiny cycle in our own lives…and in yours! We look forward to those valiant beings that join us on this journey. Let your new cycle begin!! Your history and negative programming is lodged in the cells of your body. Using this 28-day jumpstart program, you’ll unweave hidden blockages within your DNA to initiate your natural life-force energy and your body’s spiritual radiance! By utilizing the energy of nature—Air, Water, Fire, and Earth—this program allows you to clear away old limitations so that you can truly begin to claim your luminous, vital, glorious body. Do you want to feel healthy and vibrant in all areas of your life? Investment: $3300. However, register before May 31st and the price is $2800. P.S. As soon as we receive your registration, we’d love a photo of you to download and print so we can put it on our personal altar to begin sending blessings and prayers your way. Also, to get to know you better, we’ll be sending you a questionnaire. Denise Linn, the best-selling author of numerous books, including Sacred Space and Soul Coaching, has researched healing traditions from cultures around the world for more than 45 years. As a renowned lecturer, author, and visionary, she regularly gives seminars on six continents, and also appears extensively on television and radio shows. Meadow Linn, Denise’s daughter, is a chef and health/vitality coach. She and Denise co-wrote of The Mystic Cookbook, which was listed by PBS Food as one of the “Top 5 Cookbooks for the Holidays” and inspired a keynote address live to 3,000 people and streamed worldwide. Meadow’s recipes and articles appear in numerous publications stateside and abroad. * We are not doctors. We do not make any claims to diagnose or cure disease or injury. Join the Mystic Chef Community! 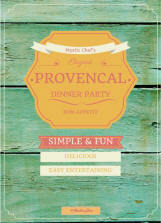 Sign up today and receive your FREE “Elegant Provençal Dinner Party” menu and recipe e-booklet! In this beautiful downloadable PDF you get easy and elegant recipes for simple and fun; yet elegant, entertaining! And you’ll become a member of the Mystic Chef® community with other giveaways and specials! Yes - I want the Goodies!